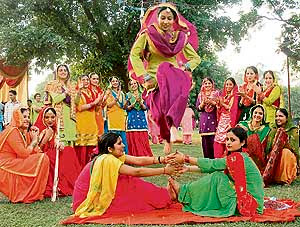 Teej is an important festival for the women of Punjab. The sawan month is eagerly waited by the people of Punjab as different festivals fall at this time period. The festival of Teej brings exuberance and chance to get along each other. Young girls and boys actively participate in events taking place in various towns and districts in Punjab. Celebration of Teej begins from the third day of sawan - the fifth Hindu month beginning from Chaitra. Young women and men enthusiastically celebrate the occasion of Teej. 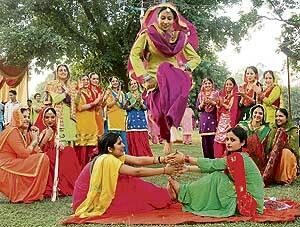 At the time of Teej, many schools and colleges in Punjab organize competitions and cultural programs. Some competitions are organized on higher scale and are attended by senior government officials. The theme of the competitions is totally traditional and cultural. Competitive categories include rangoli, mehndi, dance, singing, painting etc. In colleges, Teej beauty contests take place where young girls passionately participate and win various titles like “Miss Teej”, “Teej Queen” and “Baby Teej”. Teej celebrations in villages too, are full of joy and verve. Young girls and women get along to perform Teej rituals. Girls swing on decorated swings called peeng and adorn their hands and feet with intricate mehndi designs. Girls who perform gidda on Teej dedicate it to their husband or to-be-husband. Some of these special Teej dance and songs symbolize that women are always ready to sacrifice their life for their lover. After the dance performance young ladies offer prayers and sing songs for good health of their love. Teej fairs called Teelan are organized which has stalls with collection of traditional items like colorful bangles, juttis, dresses and earrings. Main attraction of Teej fair are the mehndi stalls. At homes, people prepare special Punjabi Teej dishes like Kheer Puri, Gulgale, Karah and Pakoras. Family members sit together and enjoy the lavish feast. Men give blessings to their wife and both pray for each others' long and cheerful life. Gharan Diya Jaiyan Bhij Gai Rooh Mitra Sham Ghatan Chad Aiyan". "Teeyan Teej Diyan Bhadon De Muklave Teeyan Teej Diyan”. Mere Veer Nu Sukhi Khand Payee." In various households, a very beautiful song is sung on Teej which describes a woman's extreme love for her soul mate. She thinks that her lover's pain and sorrows are her own. Lali Merian Akhan De Wich Aiyee". The song given below depicts a love scene in which women consider her man to be a face of God. Tun menu Rab Lagdha Naleh Naleh Makka Te Madina Aa". This song depicts a girl's desperation to meet her lover who is away for work. Mera Lakhan Da Sawan Jaye. Bherha pee-pee kar ke bole.